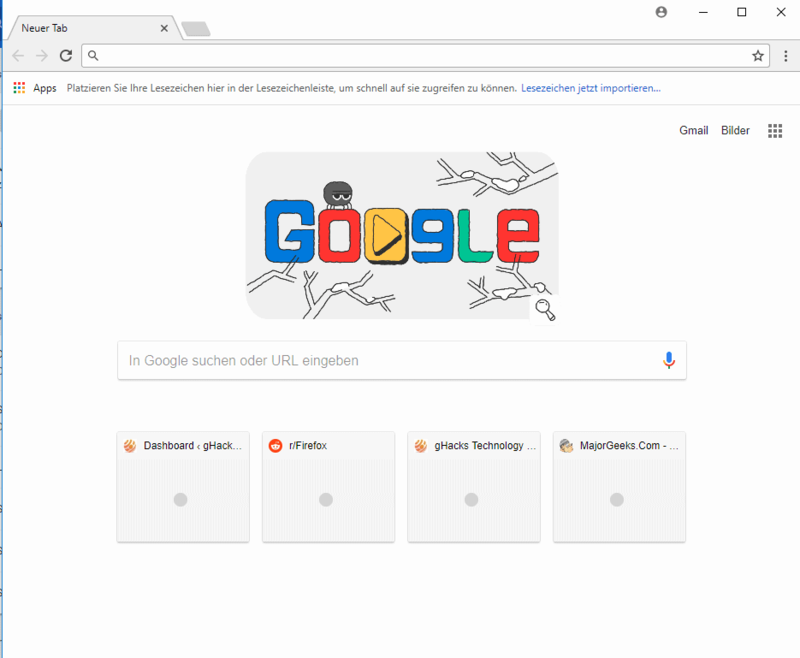 Google rolled out a change recently in Chrome 64 that uses the size of the browser window to determine the number of tiles displayed on the browser's new tab page. Users who run the browser in low resolutions may have had the websites tiles on Chrome's new tab page reduced from 8 tiles to 6 or 4 tiles depending on the resolution. Some users rolled back version 63 of the web browser as a consequence but that is not really a permanent option considering that new Chrome versions introduced security updates among other things regularly. It is not recommended to downgrade Chrome. So, what can affected Chrome users do so that Chrome displays eight tiles instead of four or six in Chrome 64? If the Chrome window is not maximized, you may maximize it so that the browser displays more tiles on the new tab page. If the browser is maximized already, zoom out to display them again. You can zoom by holding down the Ctrl-key and using the mouse-wheel to zoom in or out. Install a browser extension that restores eight tiles: New Tab Reloaded -- This extension restores the classic Chrome 32 and earlier New Tab Page. It displays tiles only and no Google search form. It is probably only a matter of time until an extension developer will publish a new browser extension for Chrome that restores Chrome 63's new tab page. One of the downsides of Google Chrome, compared to Firefox, is that Google limits the customization options. This is one of the disadvantages of Chrome in my opinion as it's sink or swim when Google makes changes. While extensions may be created that undo changes, these are fairly limiting in many regards and especially so when it comes to interface customizations. Now You: Are you affected by the change? Google also changed chrome://extensions in Chrome 65 to Tiles display. Not affected. I have the Replace New Tab Page Extension in my woolyss chromium set to open my home page, Duck Duck Go in new tabs. Opera 51 has a super New Tab function but I normally use (under Win10 x64) Ghrome x64 beta currently at Version 65.0.3325.73 , and I forget about Chrome New Tab design. instead I use Google’s extension Earth View from Google Earth Version 2.18.5 . I have 8 tiles on new tab page with Chrome 65 beta. It depends on the resolution of the browser window. I use the humble new tab chrome extension and in my opinion it is the finest new tab extension there is. Pity it will not function correctly in firefox. Also not affected, despite having a 1366×768 screen. The author of the GreenChrome hook wrote code to patch files in resources.pak on-the-fly; extending it to hide the stupid Google Doodle and the redundant search bar still has me seeing eight tiles on 65 Beta’s NTP. If you run “Google Arts & Culture” extension v. 2.0.0 on Win10 x64 using Chrome 65,0.3325.73 beta x64, if you click on its lower right icon, you see 3*3=9 links in that window, which can be resized with ctrl-Mousewheel to display in the size you prefer.